The present work contains a revision of the Black Fungus Gnats (Insecta, Diptera, Nematocera: Sciaridae) of the Palaearctic Region. The opening section contains a historical review in which important workers in the field of sciarid research are discussed and their taxonomic oeuvre evaluated. Other sections contain fundamental information on the occurrence, distribution, biology and individual development. Our discussion of this family also devotes much space to describing successful methods of rearing, the role of sciarids in nature, their economic importance as pests of greenhouse plant cultures, and the biological control of the major pest species. A separate section is devoted to the migratory behaviour of sciarid larvae, the "army worm" phenomenon. These introductory sections are completed with a detailed characterisation of the family and a discussion of its systematic position within the Diptera. The results of our revision of the sciarid fauna of the Palaearctic region have led not only to great changes in taxonomy and nomenclature but also to a considerable increase in the number of species. At the species level, it has been necessary to make 375 lectotype designations, 143 new combinations and 3 changes of status. In addition, 4 preoccupied names were replaced and 199 new synonyms discovered. At the present time the list of described Palaearctic Sciaridae stands at 836 valid species, 412 synonyms, 24 species incertae and 41 nomina dubia. So far as supra-specific taxa are concerned, 91 names have been recorded from the Palaearctic region of which 33 are synonyms according to present knowledge. A hypothetical phylogenetic tree for the Palaearctic sciarid genera could be developed. The weak points in this tree [convergence, non-monophyla] or alternative hypotheses of relationship are discussed at the relevant points. From this analysis, we recognise in this revision a classification of the Palaearctic Sciaridae composed of 28 genera and 30 subgenera. In order to facilitate identification of the species, 61 species groups have been defined and under each genus a list is given of the included species. To resolve various taxonomic-nomenclatural, phylogenetic or zoogeographic problems we also partially revised selections of material from the Afrotropical, Australian, Nearctic, Neotropical and Oriental regions. The results from this study were of considerable significance for the present revision because they contributed to almost every one of the topics covered, substantially enhanced the discussion of Palaearctic faunistic elements, and consequently they run through the entire work. Some of the non-Palaearctic types that we revised are of direct relevance to this Palaearctic revision. For this reason, we have included an appendix in which redescriptions are given of certain type-species and of relevant species from other faunal regions. The present work has very much the character of a Handbook, in which everything of value and interest about the Black Fungus Gnats of the Palaearctic Region has been included. The bibliography claims to be complete at least as far as the descriptive literature on the recent Palaearctic fauna is concerned. The results of our revision are illustrated by 612 figures, 4 diagrams and 3 tables. As a work of reference, it contains the most recent research results on the taxonomy and classification, a comprehensive list of sources, and an index of sciarid names. Moreover, the updated check list, which is based on a revised nomenclature and a stabilised classification, subsumes current "state-of-the-art" knowledge of the species of the Palaearctic region into a species inventory. The 18 identification keys provide the user with a much improved tool for identification, which includes for the first time all the revised species of the Palaearctic region. With these keys species can be assigned to genera, subgenera and species groups. In addition, the non-specialist, confronted with the task of identifying sciarids, is provided with the possibility of narrowing down considerably the number of species that he has to take into consideration. In der vorgelegten Arbeit werden die Trauermücken (Insecta, Diptera, Nematocera: Sciaridae) der paläarktischen Region revidiert. 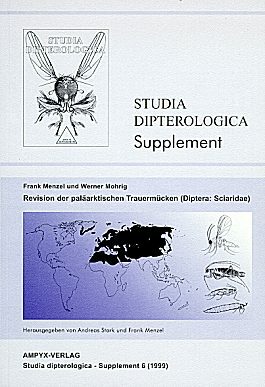 Die einleitenden Kapitel befassen sich mit einem entomohistorischen Überblick, in dem wichtige Persönlichkeiten aus der Sciaridenforschung vorgestellt und ihr taxonomisches Gesamtwerk gewürdigt wird. Andere Kapitel enthalten grundlegende Informationen zum Vorkommen und zur Verbreitung sowie zur Biologie und Individualentwicklung. Bei der Vorstellung der Dipterenfamilie nehmen auch erfolgreich praktizierte Zuchtmethoden, die Rolle von Sciariden in der Natur, ihre wirtschaftliche Bedeutung als Schädlinge in Gewächshauskulturen und die biologische Bekämpfung schädlicher Arten einen breiten Raum ein. Dabei wird auch dem eigenwilligen Wanderverhalten von Trauermückenlarven - dem Phänomen des "Heerwurms" - ein gesonderter Abschnitt gewidmet. Komplettiert werden die einleitenden Teile mit einer ausführlichen Familiencharakteristik und einer Besprechung der Stellung der Trauermücken im System der Diptera. Mit den vorgelegten Revisionsergebnissen zur Sciaridenfauna der paläarktischen Region ergaben sich nicht nur große taxonomisch-nomenklatorische Veränderungen, sondern auch hohe Inventarzuwächse. So waren auf dem Artniveau 375 Lectotypendesignationen, 143 Neukombinationen und 3 Statusänderungen erforderlich. Außerdem wurden 4 präokkupierte Namen ersetzt und 199 neue Synonyma aufgedeckt. Für die rezente paläarktische Fauna ergibt sich zur Zeit ein beschriebenes Gesamtinventar von 836 validen Arten, 412 Synonyma, 24 species incertae sedis und 41 nomina dubia. Auf der Ebene der supraspezifischen Taxa waren für die paläarktische Region 91 Namen feststellbar, von denen nach gegenwärtigem Kenntnisstand 33 Synonyma sind. Für die paläarktischen Sciaridentaxa der Gattungsgruppe konnte ein hypothetischer Stammbaum entwickelt werden. Die Schwachpunkte des erarbeiteten Systems [Konvergenz, Nicht-Monophyla] oder alternative Verwandtschaftshypothesen, werden an entsprechender Stelle mehrfach diskutiert. Damit wird in der vorgelegten Revision ein System für die paläarktischen Sciariden vertreten, das sich aus 28 Gattungen und 30 Untergattungen zusammensetzt. Um die Bestimmbarkeit der Arten zu erleichtern, wurden 61 Artengruppen gebildet und jedem Genus eine Liste der eingeschlossenen Spezies beigefügt. Zur Klärung von taxonomisch-nomenklatorischen, phylogenetischen oder zoogeographischen Fragestellungen wurden partiell auch Faunenausschnitte aus der Äthiopis, Australis, Nearktis, Neotropis und Orientalis bearbeitet. Die erzielten Ergebnisse waren für die Revision von tiefgreifender Bedeutung, weil sie auf fast alle behandelten Themenbereiche reflektieren, die Diskussion über paläarktische Faunenelemente wesentlich bereichern und folglich die gesamte Arbeit durchziehen. Ein Teil der revidierten außerpaläarktischen Typen besitzt zudem einen unmittelbaren Bezug auf die vorgelegte Paläarktis-Revision. Aus diesen Grund werden im Anhang figurierte Redeskriptionen von ausgewählten Typusarten und von relevanten Spezies aus anderen Faunenregionen mitgeteilt. Die vorgelegte Arbeit trägt den Charakter eines Handbuches, in dem alles Wissenswerte über die Trauermücken der Paläarktis zusammengetragen wurde. Die vorgestellte Literaturliste erhebt zumindest für den deskriptiven Bereich der rezenten Paläarktisfauna den Anspruch auf Vollzähligkeit. Mit 612 Abbildungen, 4 Diagrammen und 3 Tabellen werden die erreichten Revisionsergebnisse veranschaulicht. Als Nachschlagewerk enthält es die neuesten Forschungsergebnisse zur Taxonomie und Systematik, ein umfangreiches Quellenverzeichnis und einen Index der Sciaridennamen. Zudem vermittelt die aktualisierte Checkliste, die sich an einer überarbeiteten Nomenklatur und an einem stabileren System orientiert, den gegenwärtigen "Ist-Zustand" zum Arteninventar der paläarktischen Region. Mit den 18 Determinationstabellen wird dem Benutzer eine stark verbesserte Bestimmungshilfe in die Hand gegeben, welche erstmals alle revidierten Spezies der paläarktischen Region einschließt. Dadurch können die zu verifizierenden Arten den eingeschlossenen Gattungen, Untergattungen und Artengruppen zugeordnet werden. Außerdem eröffnet sich auch dem Nichtspezialisten die Möglichkeit, bei Bestimmungsarbeiten den Kreis der in Frage kommenden Arten wesentlich einzuengen.